The Gallien-Krueger Neo410 bass speaker cabinet offers you high-powered performance without breaking your back during transport. 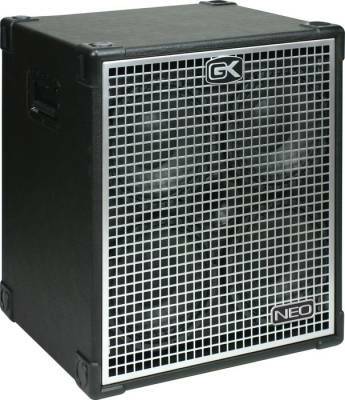 Part of GK's Neo Series speaker cabinets, at the Neo410 cab's core are 4 10" GK Paragon cast-frame neodymium loudspeakers. The speakers maintain high power output while producing silky-smooth natural tone with consistent response from top to bottom. They've also been designed with reduced weight for your gigging convenience. Removable casters help you move the cab easily. The Neo410 speaker cab provides plenty of definition in the highs and mids with an abundance of fat, punchy low end. This bass cab may be used in standard full-range operation or with GK's innovative Horn Bi-Amp System. Special chambering and bracing have been incorporated in the cabinet design to eliminate standing waves so that nothing gets in the way of your performance. Other features include a high-quality horn, black Tolex covering, recessed spring-loaded handles, rugged steel grille, custom interlocking corners, and 11-ply poplar construction.